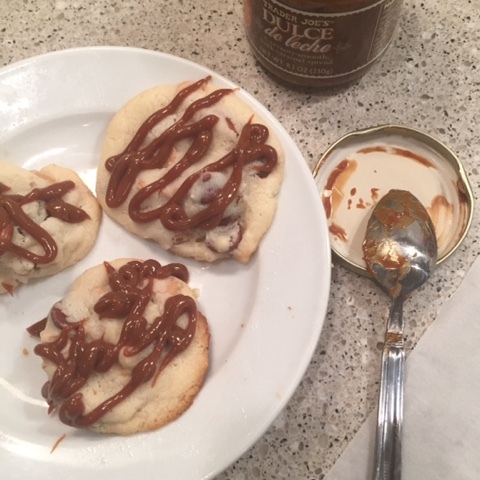 Year Twenty Nine: Cookies and Dulce de Leche, Need I Say More? Cookies and Dulce de Leche, Need I Say More? Two posts in one day? Guys, this is important. The only change I'd make next time is adding a bit more pretzels. That salty crunch is, EVERYTHING. By day three we were full on addicted, making cookie sandwiches slathered with dulce de leche. I was sold after 3 1/2 sticks of butter. That sounds very yummy and tempting. I just cannot wait to try out this recipe. The cookies look amazing in the pictures, I hope mine turn out to be just as amazing if not more.